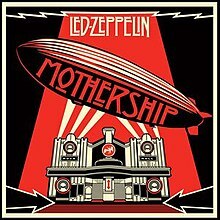 "Mothership" is a greatest hits compilation album by English rock group Led Zeppelin, released by Atlantic Records and Rhino Entertainment on 12 November 2007 in the United Kingdom, and 13 November 2007 in the United States. It was released on the same day that Led Zeppelin's entire catalogue became available in digital stores, including the iTunes store. The cover (designed by artist Shepard Fairey) is a graphical interpretation of the Beresford Hotal, Glasgow, Scotland. The songs included were chosen by the surviving members of Led Zeppelin, Robert Plant, Jimmy Page and John Paul Jones, and represent eight of the band's nine studio albums. In addition to a two-disc set, the album is also available in both "deluxe" and "collector's" editions with a DVD featuring varied live content from the previously released Led Zeppelin DVD (2003). The 4-LP vinyl package was also released on 26 August 2008. Packaging for the four-disc LP set. The album debuted at #4 in the UK Albums Chart, with 58,000 units sold, and debuted at #1 on the Official New Zealand Albums Chart and stayed there for several weeks. The album also debuted at #7 on the US Billboard 200 chart, selling about 136,000 copies in its first week. The album has sold over 2.1 million copies in the U.S and over 4.5 million copies worldwide, leading to it being certified 2x Platinum by the RIAA. Ian Stewart – piano on "Rock and Roll"
U.S. Atlantic R1 344700 stereo box set (2007). Box set manufactured in the United States of America. The 4 x HQ 180g vinyl records attain a strong excellent grading, suggesting very few plays. All record centre labels are clean and unmarked. All record centre labels are free from tears, stains or stickers. The 4 x record covers are in excellent condition, displaying only minimal signs of wear. The 16 page booklet is perfectly presented. The original paper insert is perfectly presented. The original deluxe archival 2-piece hard box is in excellent condition, displaying only minimal signs of wear.